Music and speech are processed very simiarly by the brain. And yet, autistic children who have trouble with words, perceive music on par with their peers (who are not autistic). This study aims to unravel this puzzle. Children with autism have impaired social interaction and language communication skills. However, their music perception abilities surprisingly remain largely intact. This dichotomy presents a unique scientific riddle: music and speech share processing pathways in the brain and yet one is adversely affected, while the other, relatively spared in Autism Spectrum Disorders (ASD). What could be the possible neurobiological mechanisms behind such incongruous duality observed commonly in ASD patients? This largely unexplored question was investigated by neuroscientists from the National Brain Research Centre (NBRC), Gurgaon. The researchers, working in close conjunction with clinicians, recruited 22 autistic children (mean age ~ 11 years) for the study along with unaffected age and gender-matched children for comparison. This study is one of the very few to have involved children from the entire autism spectrum, not just high-functioning savants, thus enabling greater generalization of results and reflecting the heterogeneity present among autistic children in society. 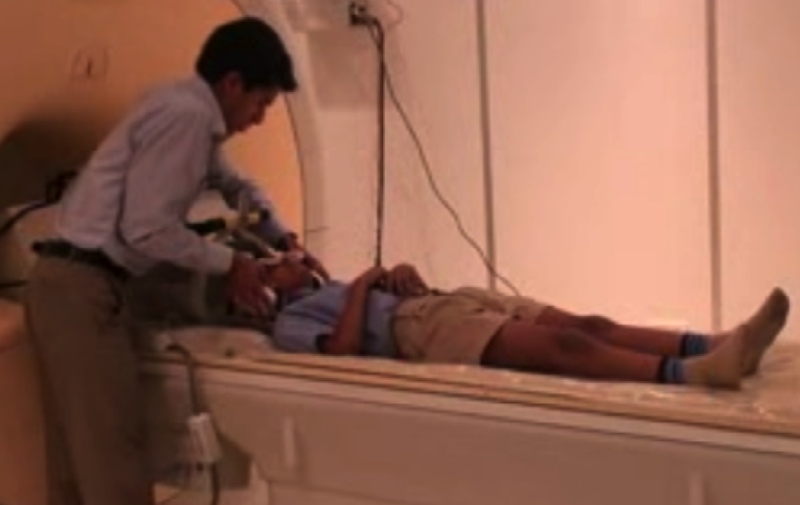 The study required the children to listen passively to simple spoken words, sung words and piano tones as their brain activity was being imaged in an MRI scanner. Speaking to IndiaBioScience, Megha Sharda, one of the researchers, said that relative to the control group, the ASD group showed decreased activity in an area called the Inferior Frontal Gyrus (IFG) in the left hemisphere of the brain when they listened to spoken words. However, there was no such decrease in response to sung words or piano tones—the activity level was comparable to that of the ‘typical’ children. The researchers had quantified verbal ability and ASD severity of the participants prior to these experiments. When they mapped the results across the Autism spectrum, they found that the lower the verbal ability, the greater is the decrease in brain activity during spoken word listening. “The brain activity profiles do seem to support the commonly observed fact that ASD patients have unimpaired music perception coexisting with deficient speech processing”, explained Megha . The researchers also analyzed the connections between different language areas of the brain and found that an important pathway in the language-processing circuitry of the left hemisphere was compromised in ASD patients. Though many of the networks for sung-word and spoken-word perception are overlapping, it is interesting that this structural impairment of the spoken-word processing pathway does not hinder their response to music. The researchers believe that there may be alternate pathways operating to circumvent the damaged tract in ASD patients. During music perception, these pathways are differentially recruited in ASD patients to functionally connect the music-processing areas. Thus, the difference in their response to music and speech stems from a difference in network connectivity. Though music and speech share certain acoustic features, speech comprises much more complex stimuli with higher socio-cognitive content. For socially-impaired autistic children, the predictability and repetitive tonal structure of music is believed to make it much more rewarding and easier to comprehend than speech. Using specially customized questionnaire, the researchers found that autistic children scored lower than the control group on the verbal ability test, but had a greater music responsiveness score, underscoring the potential for music therapy. In a milieu full of scientific studies describing the deficits in ASD patients, this study focuses on their preserved abilities. This paper provides a neurobiological basis for the preserved music-function in ASD patients. Based on their findings, the authors suggest that music-based interventions might rescue some of the speech-deficits, given the commonalities between the structure of music and speech. The clinical collaborators in the study are currently looking into the possibilities of incorporating music in rehabilitative and interventional strategies for ASD, which might help autistic children leap into a musically tuned future.